Teachers have had enough of unprecedented attacks on education and their profession by the Coalition. 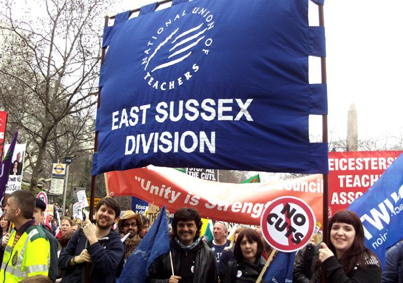 Members of the NUT – the largest teachers’ union in most Sussex schools – are taking strike action this Wednesday to Stand Up For Education against Gove’s unremitting attacks on our state education system. Gove has backed free schools and forced schools to become academies in a drive to stealthily privatise education and simultaneously undermine teachers’ authority, status, pay, conditions and pensions. excessive workload and bureaucracy – could you cope working nearly 60 hours a week like the average primary school teacher or even 56 hours like the average secondary school teacher? in defence of the teachers’ national pay scale which, like the collaborative nature of teaching is undermined by performance related pay . Do you really want your local school head wasting their precious time negotiating individual pay agreements with every teacher? unfair pension changes – do you want your children being educated and looked after everyday by teachers aged 68 or older? The Mirror’s Fiona Phillips has declared her full support for striking teachers and awarded a gold star to Wednesday’s strike by NUT members. We ask you to do the same. 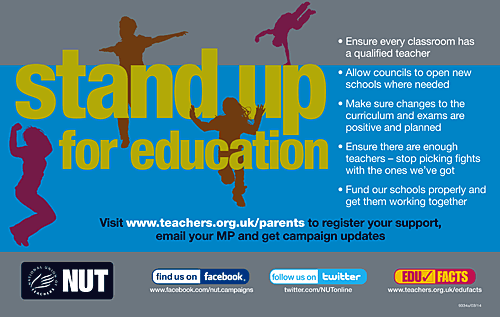 In Brighton & Hove you can support teachers locally by joining one of the three marches starting from Blakers Park, Saunders Park and Hove Town Hall at 10.30am. These will lead to a rally at The Brighthelm Centre at 11.30am. In Eastbourne, meet at the Bandstand on the seafront at 10.30am. In Hastings, meet at the White Rock Theatre at 10.30am. 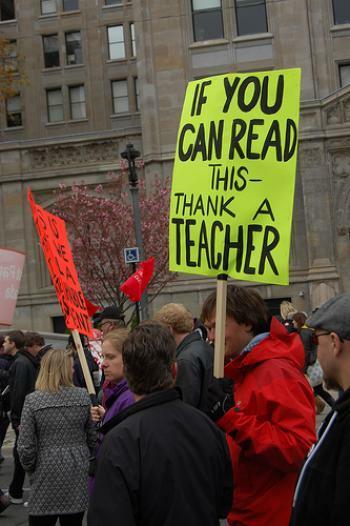 “Teachers have had enough. They’ve had enough of the attacks on their pay, on their pensions and their working conditions. But most of all they’ve had enough of the attacks on education. It’s time to stand up for education. It’s time to stand up for teachers. 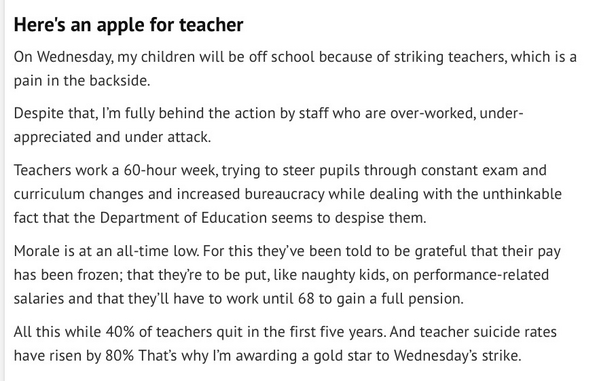 Please support the strikes.” This blog from Teachers ROAR was written before one of the earlier teachers’ strikes, but it explains exactly why, like Fiona Phillips, we should all support Wednesday’s national NUT strike. 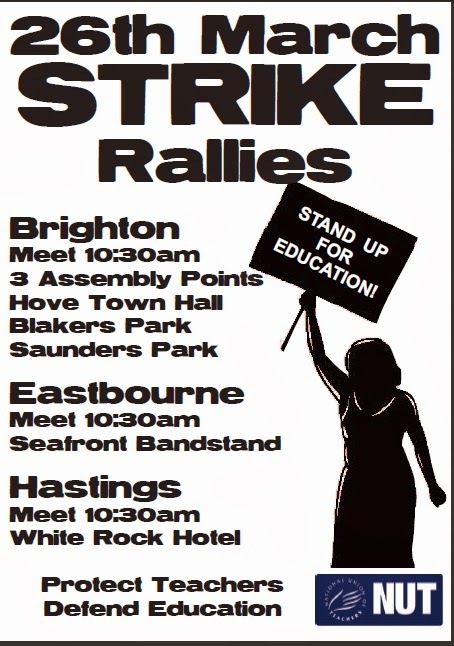 Please show your solidarity with striking teachers on Wednesday 26 March 2014 and make a date to join us at Community Base in Brighton on Saturday 19 April. Discuss how Labour can re-build trust with teachers with Kevin Courtney – NUT Deputy General Secretary, Nancy Platts – Labour’s parliamentary candidate for Brighton Kemp Town & Peacehaven, Brighton school student Sian Carey, plus representatives of local teaching assistants and teachers. Meeting starts 7pm; refreshments will be available from 6.30pm. See our Events section for full details.